R.M. 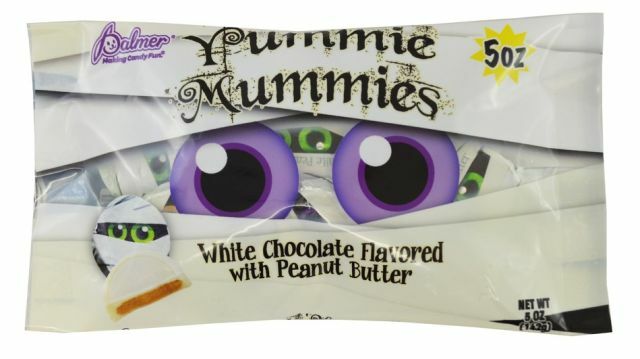 Palmer releases four new candies for Halloween 2018 including Yummie Mummies, which are white chocolate-flavored discs filled with creamy peanut butter and wrapped in mummie foil. 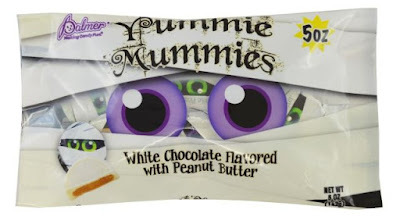 - Gravestone Greetings - Tombstone-shaped chocolaty candies wrapped in Halloween foils with name puns such as "Bea A. Fraid" and "Ina Boxx." - Pumpkin Spice Chocolaty Cups - It's somewhat obligatory at this point it seems. - Milk Chocolate Flavored Balls - They come wrapped in black and orange foils. All four seasonal candies come in 5-oz bags with a suggested price of $1.00. Photo via R.M. Palmer Company.